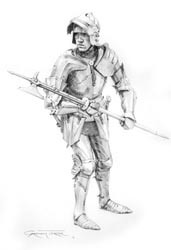 This page shows some of Graham Turner's pencil drawings of armour that have sold, but which might be of interest to those with an interest in armour and the Wars of the Roses. English knight c.1415, based primarily on the tomb effigy of Sir Edmund de Thorpe, with some details from other effigies. Pencil Drawing by Graham Turner. English knight c.1471, based on the memorial brass of Richard Wylloughby, Wollaton, Nottinghamshire (see below right). This armour displays some Italian characteristics, notably the asymetrical pauldrons and couters, although these have been extensively fluted and cusped to suit the English style. Nobles, knights and wealthy men at arms would have fought and died in armour like this during the Wars of the Roses - the date attributed to this brass is the same year as the battles of Barnet and Tewkesbury. English knight c.1480, based on the tomb effigies at All Saints Church, Herstmonceux, Sussex (see below right). This is an Italian export armour, basically following Italian forms, but adapted to suit the taste and fashions of its English owner. The effigies wear tabards, so Graham has recreated the appearance of the cuirass incorporating design elements from the rest of the harness; the distinctive fleur-de-lys from the demi-greave is repeated at the top of the plackart, which also incorporates some flutes, reflecting those that can be seen on the tassets - both features that appear on other armours of the period. The salet is topped with a gilded ball, as depicted in the well known Beauchamp Pageant, which is contemporary with the effigies. English knight c.1482, based on the tomb effigy of Sir William Harcourt.